Getting ready for Easter. For those who send out Easter or Spring cards, this is a fun shape without doing the same “egg” year after year. This beautiful oval window card can be used for Easter, a birthday or any special occasion. 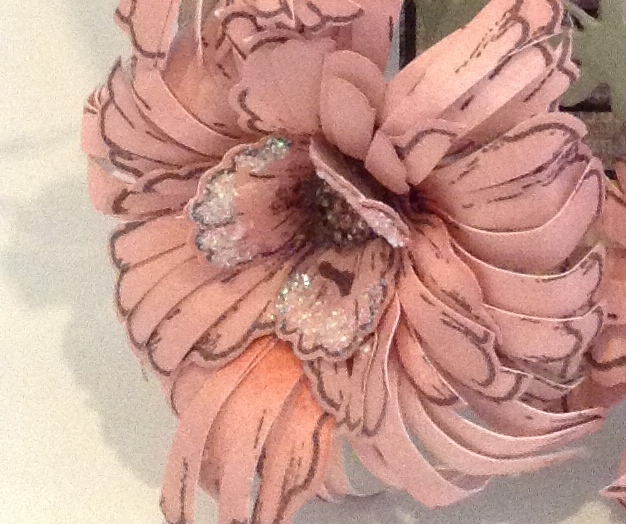 The flowers are Delicate Asters by Heartfelt Creations. I used the oval cut from the aperture to make a glittered background behind the grate effect. Gold accents really make this card shine. Hope you all have a great and sunny weekend! A true girly card to start the weekend. I love mixing different die cuts and layering them together. (ok, I love all crafting:)) For this card I dry embossed the light blue cardstock, layered it and then wrapped the ribbon before I attached it to the base. The die cuts were cut from solver mirror board, dark blue and light blue. I finished it off with the pearls. It’s always fun to play with contrasts. I love embossing on dark colors! This card uses the Classic Sunflower stamp and dies from Heartfelt Creations. I used the stamp as my background and then embossed with yellow and orange embossing powders. I used a white gel pen to accent the background. The flowers I colored with alcohol markers and the centers are coffee grounds. I used gold foil on the edges of my card stock and layered onto my base. What kind of card do you make for a teenage boy? Keep it clean and simple. For this card, I used a few different little stamps to create my background. I clear embossed them and then inked with distress inks. I used 2 of the same stamps for my sentiment circle except I stamped with the distress inks before applying my clear embossing powder. I love embossing backgrounds, whether it’s dry embossing or heat embossing. The added dimension really brings a card to life. I tried to keep the design simple to accent the embossing. I hope you all have a chance to stamp this weekend. Maybe pull out a stamp set that you haven’t used in a while and play. Happy Wednesday to you all! I hope your week is going well. With all of the great weather we have been having in California, I feel like Spring is in the air already. For this card, I wanted it to feel light and airy, like Spring. The Imperial Square die from Spellbinders definitely gives that light and airy feeling. 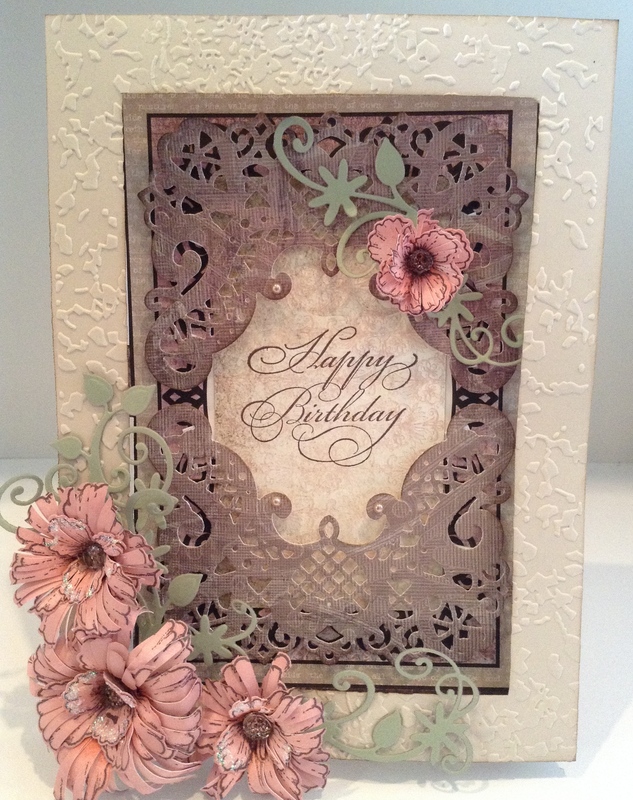 I layered the Imperial Square die cut atop the Tattered Lace Handmade Paper embossed background. I love the Tattered Lace Handmade Paper Embossing Folder. It has so many different looks depending on how you use it. In this background, it almost looks like blades of embossed grass. I used the strip embossing folder from the Tattered Lace Floral Diamond Collection and wove it thru the Imperial Square. 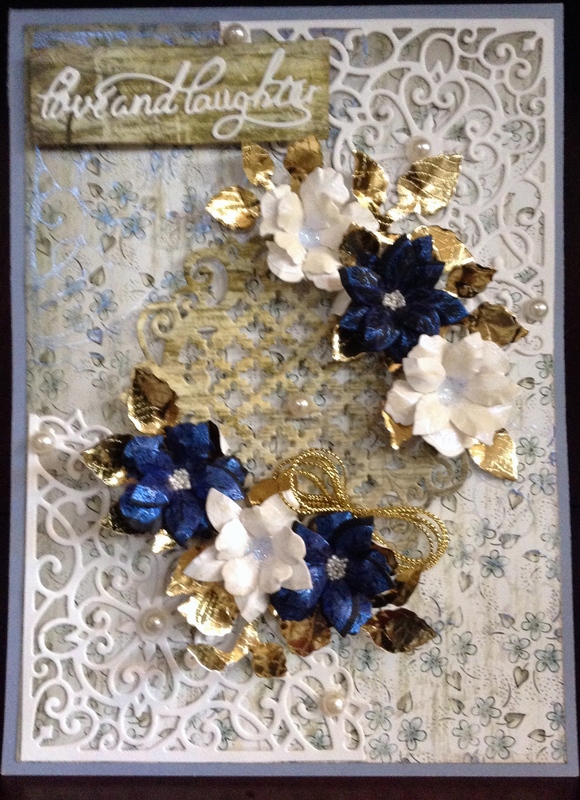 I layered my sentiment and finished the card with flowers, ribbon and pearls. This card will be perfect for a wedding shower or a summer birthday. I hope you have the time this week to enjoy your craft. I love the window cards! So versatile…you can do looking out the window, looking in, different house facades, different window treatments, etc. With all of the window die cuts and stamps available, you can now add these to your “quick card” collection. It’s also a fun way to use all of your embossing folders. You can use 1 folder for the entire background (see below) or split into 2 as above. Happy Saturday to everyone! I hope you had some time to craft today. I was inspired today to work with clear cardstock. I really wanted to emboss my images and then color them with alcohol inks but that didn’t go so well. When I tried to heat set my embossing powder, the clear cardstock started melting. So sad. Never one to give up, I rerouted myself and stamped my images with StazOn. A note to those who have never stamped on clear cardstock or glossy cardstock, do not move your stamp while pressing down or your image will smear. So, for this card, I used the Italiana Riviera Collection by Heartfelt Creations. I love this collection! Definitely one of my all-time favorites. For my base, I attached my clear cardstock to a piece of white cardstock. I decided what image I wanted for the inside of my card and placed it roughly where I wanted it to go. I then stamped and colored all of my images on the clear cardstock. For the grapes, I used Spectrum Noir PL4 and PL5. The leaves are DG3 and the vines are EB8. Since the cardstock is clear, you might notice you need a darker color compared to when you color on white cardstock. I used design papers from the paper pack to embellish the inside of my card. For the outside of the card, I stamped, colored and die cut the large grape cluster from the Italiana Grapevines stamp set. I used my crocodile to set a brad into the leaf and attached it on the side of my card with some wine colored ribbon. I took a photo so you could hopefully see the different layers. I hope you are inspired to try and work with clear cardstock. Having fun with all of the different flower petals is one of my favorite parts of crafting. For this card, I used the Blazing Poppy stamps and dies by Heartfelt Creations. I stamped the petals on white card stock with brown StazOn and then die cut them. I colored the centers with Fired Brick Distress ink by Ranger and the petals with Victorian Velvet Distress ink. To make my poppies look a little more vintage, I cut each petal down toward the center along each the dark lines. I layered 3 poppies together to make 1 flower. My version of “Tattered Poppies”. Today I was in the mood for something lacy and floral. For this card, I did a few different things that give your favorite die cuts a new look. I took my small Decorative Blossom Corner by Heartfelt Creations and die cut foam. I then stamped the image with Versamark onto paper from the Sunny Day Collection. I used a fun embossing powder called Blue Shell. I used it on the Decorative Blossom Corner stamp, as well as, all of the Mini Floret flowers. You can see (hopefully) that the powder is an iridescent blue on the patterned small floral paper, a pearlescent blue on the white paper flowers and a vibrant blue on the black paper flowers. I shaped and put together the flowers with centers of white prills and pale blue glitter. I then die cut 2 Decorative Blossom Corners and 1 Raindrops on Roses oval and attached to my base. The leaves are done on gold paper and are the Open Leaf die cut by Heartfelt Creations. I accented with a few pearls and a “Love and Laughter” sentiment.